We all sort of know what an ice box is – an early refrigerator, sort of like a cooler. But did you know or think about how our modern French-door, freezer drawer, SubZeros and the like evolved from the simple ice box? Early refrigeration was simple – a block of ice, usually harvested from a pond or other local fresh water source, was placed in a box along side perishable foods. The ice was replaced as it melted, chipped with an ice pick for ice cubes, and possibly even shaved for a sweet treat. These early ice boxes replaced the even more simplistic method, which was to have a hole in the floor and the ceiling of your pantry to allow for cool air to flow through the room, or even to have a root cellar under the house. So, yes, the early 1800s saw the invention of indoor refrigeration to the extent of bringing ice into the house. The name “ice box” stayed around until the early 20th century, and even my parents used it when we were camping, as our trailer had what equates to the size of a modern under-counter fridge, but it used a block of ice. Cookies were usually baked as soon as the dough was prepared, but with the advent of the ice box, dough could be chilled for later use, or for different baking properties. Ice box cookies are simply cookie dough that has been rolled into a tube or round loaf, then refrigerated, and when ready for baking, sliced into wafers. The tubes of cookie dough from Pillsbury are considered ice box cookies, although today we would call them refrigerator cookies. Traditionally, they are most often sugar cookies. 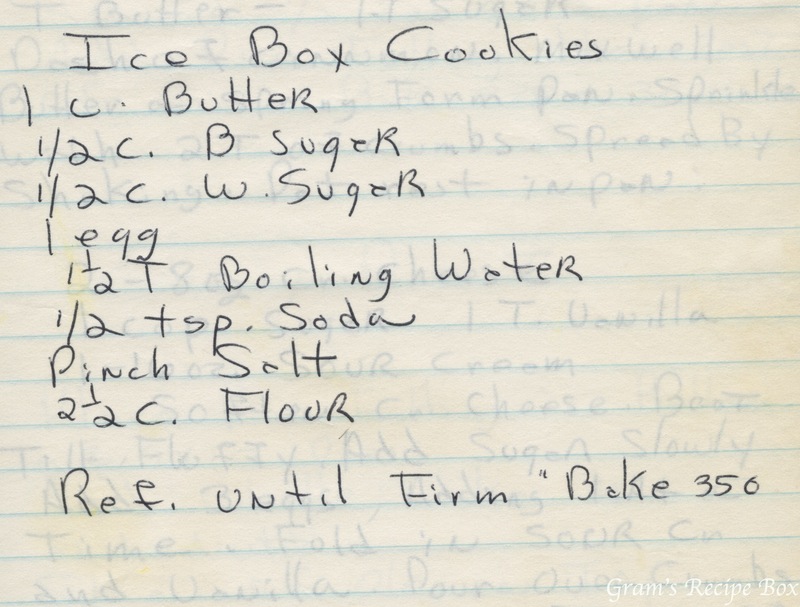 So, to use this recipe, mix it up, roll it in a tube wrapped in cellophane, then slice out 1/4″ wafers and bake. I’m guessing about 10 minutes, but watch them on your first pan. refrigerate until firm, bake 350.